WES Global Talent Bridge has selected eight communities to receive customized technical assistance to help advance their skilled immigrant integration efforts. The eight communities join eight “alumni” localities from a 2018 pilot that will stay connected to the growing program by mentoring and other activities going forward. Thus, 16 cohorts across the country – from Maine to Alaska – are all now working with WES to meaningfully integrate the professional skills and talents of immigrants into their local economies. Based on their track records of supporting immigrant professional success through local programs and initiatives, the cities of Anchorage, Alaska; Boston; Des Moines, Iowa; Lincoln, Neb. ; Pittsburgh; Portland, Maine; and San Diego; as well as the state of Texas (where the program will be anchored in Austin); were chosen to participate in the 2019 program. In the course of the year, the Global Talent Bridge team and other national experts will provide each of the communities with a total of 24 hours of hands-on coaching, advising, and technical assistance as well as four interactive web-based training sessions on immigrant professional integration. 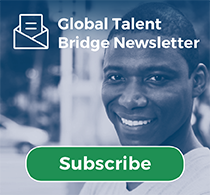 Global Talent Bridge will lead monthly calls where communities will share ideas and provide updates on their progress. Additionally, Global Talent Bridge is sponsoring delegates from each of the eight communities to participate in a working cross-border conference in Toronto, Canada this summer.